Christmas 2013 has now come and gone and 'We the People' got yet another lump of coal in our stockings courtesy of Barack HUSSEIN Obama. This time it came in the form of a publicity stunt bar none, complete with much media fanfare. Just in time to slip in under his own yet again ILLEGALLY changed sign-up deadline to still receive health insurance starting on January 1st, our Constitutional trampling president had his staff sign him up for the ObamaCare 'Bronze Plan' via the DC Health Care Exchange. But what's NOT being widely reported...guess I'll have to change that right here and now...is that the 'Bronze Plan' is the cheapest plan available for someone his age...as in less than $400 per month in premiums (pocket change for multi-millionaire Obama)...and is a plan Obama has absolutely NO intention of ever using for all US presidents in their capacity as Commander-in-Chief have military health coverage including physicians ready to provide free medical care at their beck and call...free for the president that is as it's paid for with our taxpayer dollars. 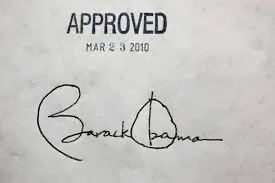 And lest we forget...Obama did NOT enroll Michelle and the kids in ObamaCare for his signing up was a token gesture at worst...a slap in the face to the American people at best..for his family's medical needs are also a perk of the job. 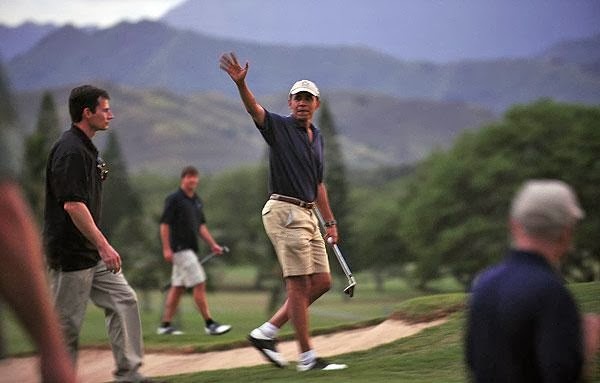 And the ludicrousness of Obama's statement claiming he's 'leading by example' has me laughing out loud for once again he's actually leading from behind as it was his staff who got their hands dirty signing him up while he's off golfing and sipping pina-coladas in Hawaii. And, by the way, no one I know...politician or otherwise...can let others sign them up for this health care monstrosity. And so this entire sign-up is NOT only a sick joke at 'We the People's' expense, but so NOT above board for how can staff sign-up Obama...or anyone for that matter...when staff does NOT have privy to certain key personal information needed to complete the sign-up process...key personal info 'We the People' are asked for when merely perusing the site before the sticker shock hits one square in the face...key personal info that Obama dare NOT enter...NOT enter truthfully anyway...for the president’s personal information...health and otherwise...is NOT readily available in the government databases Healthcare.gov uses to verify that the identities and the information given is both truthful and real. And why is that...for security reasons White House officials claim but we know otherwise now don't we...as in secrets to hide...LIES to cover-up...stories to make-up... and on and on it goes ad-nauseum. So Barack HUSSEIN Obama can try and fool us by having his flunkies on staff say anything, claim anything, report anything, sign-up for anything, and there's NO way for any of us to verify if what's being reported is true or even if the actual sign-up went through. 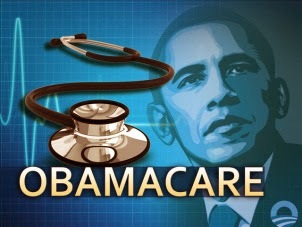 And so all this bravado is NOTHING but a symbolic 'dog and pony show' so Obama can say he stood behind the product that has come to bear his name and that he did fulfill the commitment he made to the American people to personally participate when he signed the 'Affordable Care Act' into law back in 2010. Yeah right...if Obama truly wants to fulfill that promise to the American people let him forfeit his military health coverage and live strictly by ObamaCare as he expects the rest of us to do. But you know that will NEVER happen...LIAR that he is. And if he for a moment thinks we can't see though this rouse he is sorrily mistaken for we know the coverage he bought was a mere token to NEVER be used...we know Michelle and the kids did NOT sign on..and we know he's sulking because there were NO photo-ops of him actually signing on for him to shove in our faces because he himself dared NOT sign on. But let him be happy knowing that now he has hospitalization he already had, maternity care that for a man is a joke, mental health and substance abuse treatment...hmmm...now that maybe he can use, and preventative services which could come in handy for that bad case of 'foot-in-mouth' disease he most assuredly has. But seriously, to add to his already growing list of Constitutional violations in regards to ObamaCare, Obama said that more time would be provided for people to complete their health insurance applications if they could show and prove that they missed the deadline because they had problems with the Healthcare.gov website...without telling us what constitutes said problems...and that they now might qualify for 'a special enrollment period'...a period of still unknown and unsaid duration. Now isn't it interesting that 'We the People' have to prove that website problems prevented us from signing up, thus missing the newest deadline because of a knowingly from day one problem-plagued government website, but Barack HUSSEIN Obama is free to disavow the wording of our Constitution in regards to who can and cannot change a bill that has been passed and signed into law...and the media and Congress remains silent...deadly silent if you know what I mean. What a scam...what a freakin' scam...and like I said before we just got another lump of coal in our Christmas stockings courtesy of our ever-loving Barack HUSSEIN Obama. Hurry up November 2014...please hurry up. THE BIGGEST PROBLEM IN WASHINGTON IS OBAMA. GET RID OF HIM AND MOST PROBLEMS GO AWAY ! Bravo Diane, bravo! Your insights as always are inspiring. Formerly one would have had to read The Onion to get journalism of this standard, but not any more!! Why don't you just go away...oh wait...your kind just loves to stalk and criticize...that's what the sheeple do best. I love that you still have your sense of humor Diane. The diseases covered under O-Care may certainly help O with some issues pertaining to his mental health and substance abuse(?) including the dreaded 'foot and mouth' disease. Great article. Thanks Daveda. And we do need a bit of humor to survive this Obama mess.